Alright I thought I'd do something for the one year anniversary of this site, so here's what I came up with. And the second is this Theme Set. The two classic themes will only work properly with the IP.Board Theme on in the background. And the blue one may have problems with custom banners. I'll add more themes and update these in the future, enjoy. Edited by ANewLight, 07 June 2014 - 06:13 PM. Classic is a great idea, but it's very buggy. If you could do Child of Red/Black from 2.0 I would love you forever. Yeah like I said in the OP The Classic themes only work with the IP.Board theme on in the background. I had to move some things around the page and the IP.Board theme never really changes, so it's easier for me to build things around. 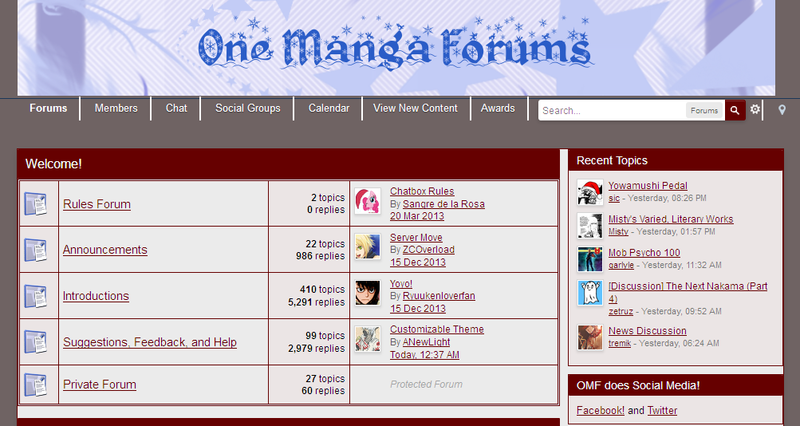 Because of that there will be some problems if you are using it with the OMF Red Classic theme on in the BG. I actually had to remove an entire part of the Classic 2 theme because it was very buggy. I'm still working on that section, but I don't think it will work out. I'd need screen-shots or of the theme. If you have any from the old site I could try to work something out. I never used that theme, so it would be hard to recreate something that I've never seen. Or hey maybe somebody has an HTML text copy or archival page grab of the theme on their computer. Even if it's only one page I could work with that. It's still super buggy on IP.Board. It stretches the page for some reason. I'm trying this on a few different browsers and I'm not seeing this anywhere. Do you have any other styles on or you using other code? Maybe my theme is clashing with something you are using on your end. I disabled everything but that. It's your theme with IP.Board. It doesn't happen on the Red one. Really? it's the opposite for me. I'll play around with it a bit and see what I come up with. 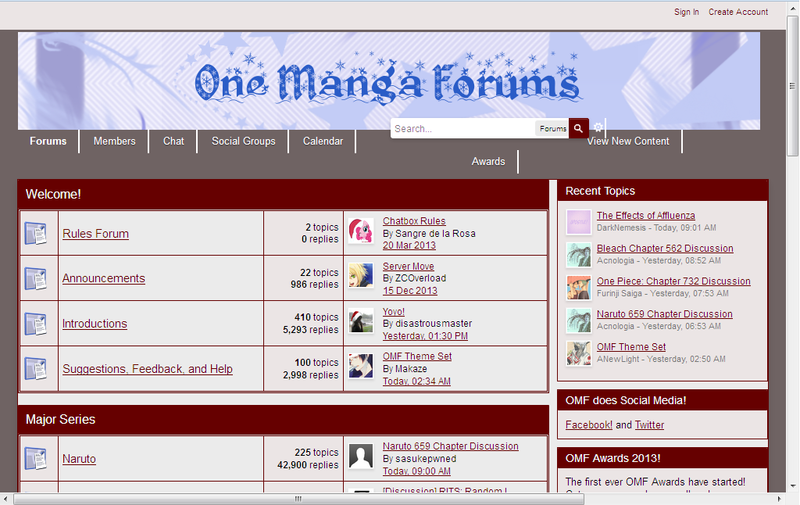 And I've also created a version of the theme that can be used on OMF Red Classic. Are you still having problems with one or both of these Makaze? Not with the page extending, but the navigation under the banner is still weird and the notification icons are not very visible. No background colour and the 'Awards' button gets pushed up onto the banner for some reason. Edited by Makaze, 18 December 2013 - 11:55 AM. Not with the page extending, but the navigation under the banner is still weird and the notification icons are not very visible. 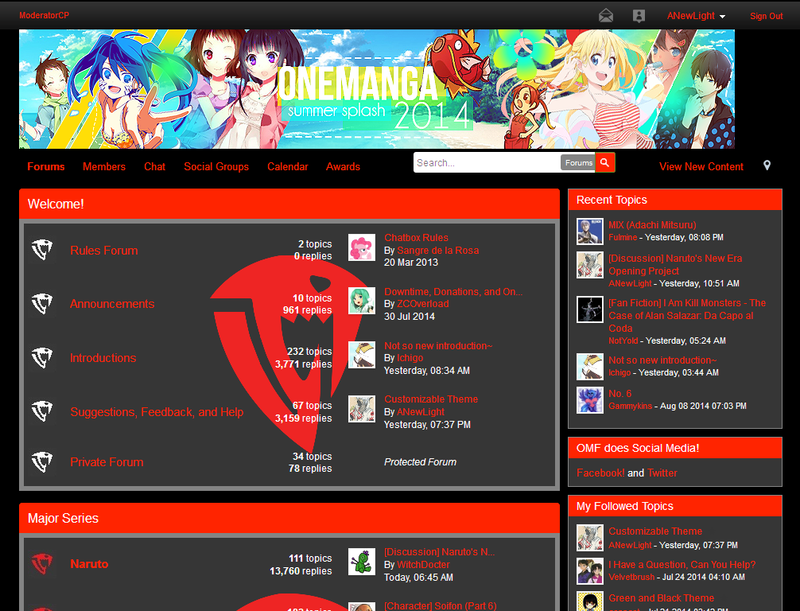 No background colour and the 'Awards' button guts pushed up onto the banner for some reason. 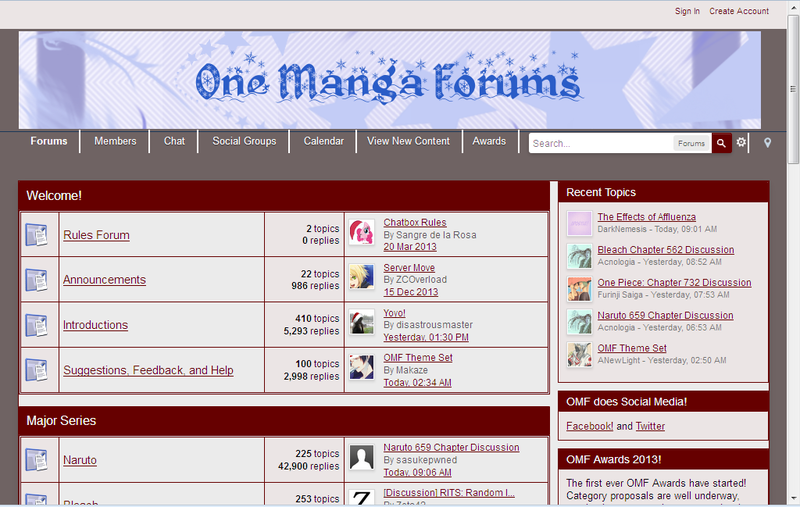 OK I can see that problem when using Onemanga Classic 2 (Red) (For OMF Red Classic) on the IP.Board theme. 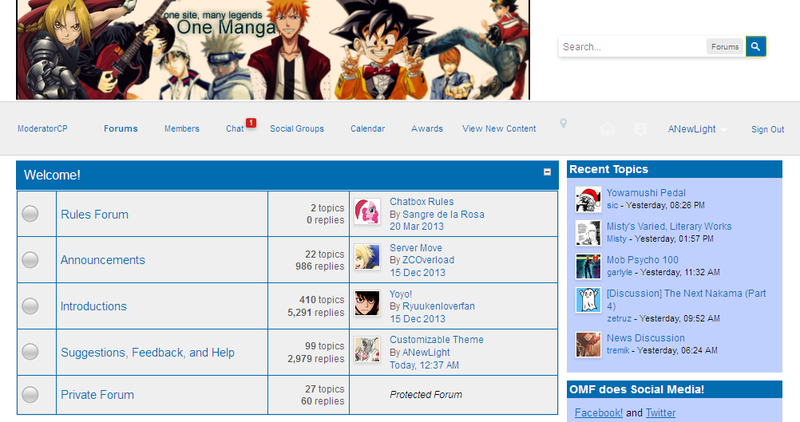 It goes away if I change the theme on the site to OMF Red Classic. And I'll get to the notification icons when I have time. I need to get ready for work right now. And I'll get to the notification icons when I have time. And it's fixed for both versions of the Classic 2 theme. I've finally added the 2013 award to the Custom awards. Edited by ANewLight, 07 June 2014 - 09:22 PM. Oh no, where were all the amazing green, black bumblebee whatever themes? I just feel like changing now. The green and black theme is here, the custom theme is here. 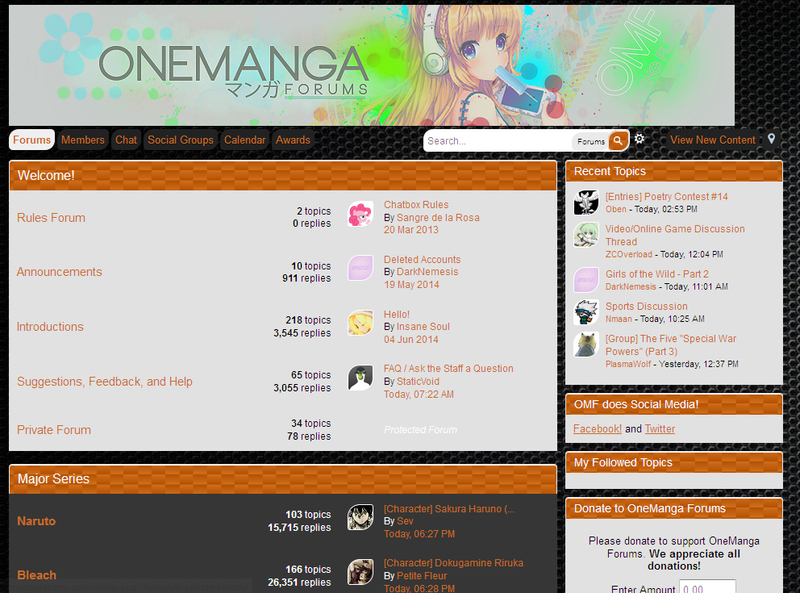 Also that bumblebee theme was something that I just threw together for Question Time, it was never fully completed. Edited by ANewLight, 17 August 2014 - 06:00 PM. ...You doin' theme requests or something?